Viewing 0 current events matching “dorkbotpdx” by Date. 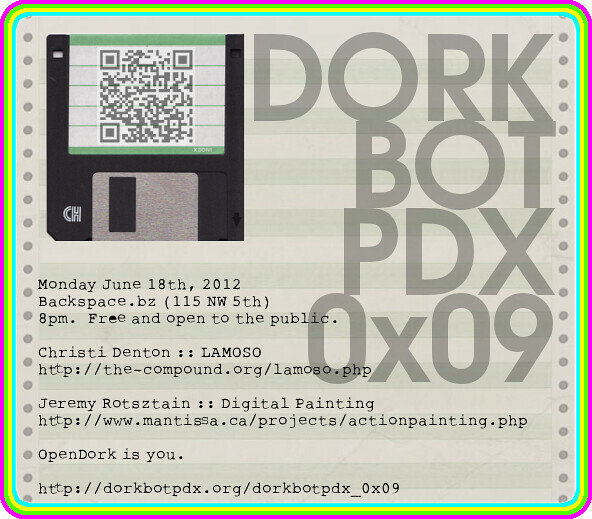 Viewing 120 past events matching “dorkbotpdx” by Date. Come meet up for a discussion of eTextiles and wearable electronics with Lynne Bruning (http://www.lbruning.com), coordinator of the Maker Faire eTextile fashion shows. Lynne will have some stuff to show off. If you have something, feel free to bring it! FEDERATED WIKI WORKSHOP LEARN ABOUT FEDERATED WIKI: A decentralized approach to collaboration and publication. It differs from a standard wiki in that you can run your own server and share your changes with others running their own servers. 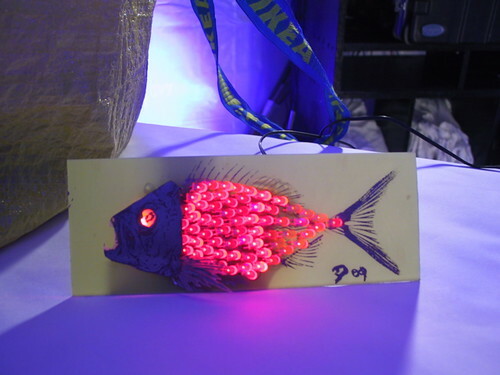 May 7, 2015 DorkbotPDX May 2015 Workshop: OPEN LAB! While having a single teacher and many students helps get ideas and skills out to the community, sometimes it is more fun to have some chaos. So instead of one to many, we'll have many to many. Bring a project or collaborate on someone else's project. We provide space and power. You bring tools and projects. Ask fellow dorks for help and offer help to others. 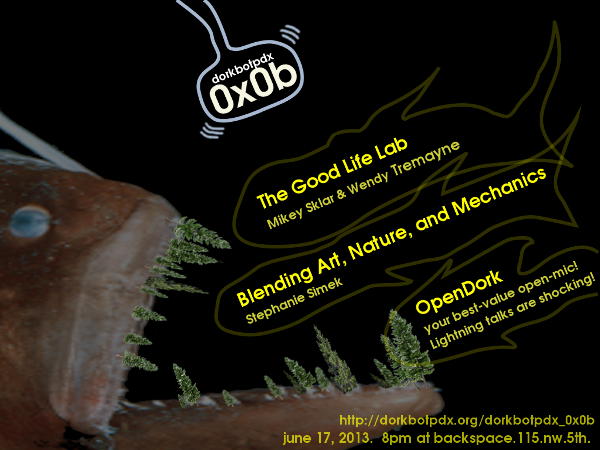 RSVP by replying at http://dorkbotpdx.org/openlab_05_2015/ with what you'll be hacking on! Experiment with solar panels and the other bits needed to charge Lithium Ion batteries via USB! Rich Burton of HooperFly gives an overview of open source drone/uav projects and flight demonstrations. We'll take a group dronie! A hands-on introduction to the Cypress PSoC device family and the (free) PSoC Creator Integrated Development Environment(IDE). The workshop will include a brief architecture and software/IDE overview, followed by hand's-on project labs. Requirements: Windows “compatible” Laptop Computer and USB port (Apple MacBook Pro with Bootcamp or Parallels works fine) Prerequisites: Basic electronics (the ability to read a schematic drawing). Basic "C" programming. Participates will walk home with a free Cypress development board! Thanks Cypress! Audience: Programmers who would like to learn more about hardware and debugging. Hackers who would like to learn new skills for quickly solving hardware problems. Students who want explore and learn about new hardware-based solutions. Professionals seeking new skills for the workplace. In this workshop we will build a "kicking legs" Halloween prop. These props are normally put under lawnmowers to simulate a lawn care accident. This project is based on a project by "Scary Terry", you can see the original here: (http://www.scary-terry.com/kicklegs/kicklegs.htm). We'll play with linkages, servos, and microcontrollers. See website for tool details! This is the first of three audio workshops coming up, exciting! The Build Your Own Teensy MIDI Encoder Workshop will show you how to use a Teensy 3.1 to create a MIDI encoder that sends MIDI OUT messages over the Teensy's micro-B USB plug. During the workshop, you will build a serial-to-parallel, parallel-to-serial switch matrix using a Teensy 3.1, a breadboard, IN4148 diodes, and reed switches (if you wish to validate the switch matrix). Darin will demonstrate how to write the switch matrix scan code and how to encode the simulated keypress signals into MIDI OUT messages using the Arduino/Teensy Keypad and MIDI libraries. Extending the code to accommodate MIDI IN, velocity sensitivity and other MIDI messages, as well as using shift registers (74HC595 and 74HC165), will be discussed. Teensy 3.1 or 3.2 with header pins Micro-B USB cable Breadboard with jumpers 1N4148 diodes Reed switches and magnets (optional) Laptop loaded with: Arduino/Teensyduino IDE or Microsoft Visual Studio using Visual Micro MIDI-Ox, (PureData can also be used to dump MIDI messages) We will have some extra supplies available. This hands-on microcontroller audio workshop will show you how to use a Teensy 3.2 and codec chip to generate and playback CD quality sound, and process and analyze audio in real time. RSVP Required, email to [email protected]. Limited to 15 people. Make things with or next to other people! Bring a project or collaborate on someone else's project. We provide space and power. You bring tools and projects. Ask fellow dorks for help and offer help to others. 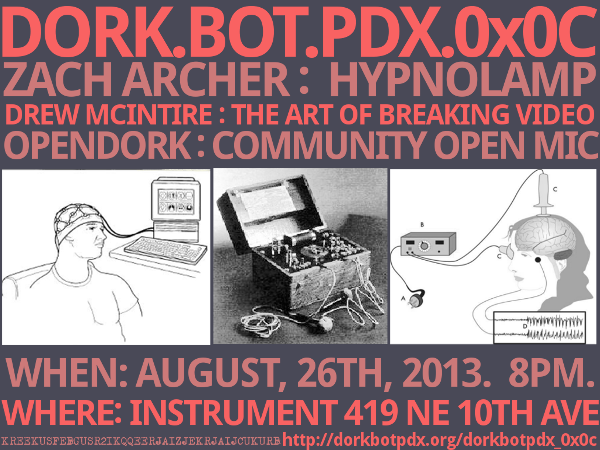 RSVP by commenting at http://dorkbotpdx.org/openlab_01_2016 telling folks what you'll be working on! Thanks to everyone leading workshops! JTAG may be almost 30 years old with little change, but that doesn't mean most people really understand what it does and how. This workshop will start with a brief introduction to what JTAG really is, then quickly dive into some hands-on practice with finding, wiring, and finally exploiting a system via JTAG. 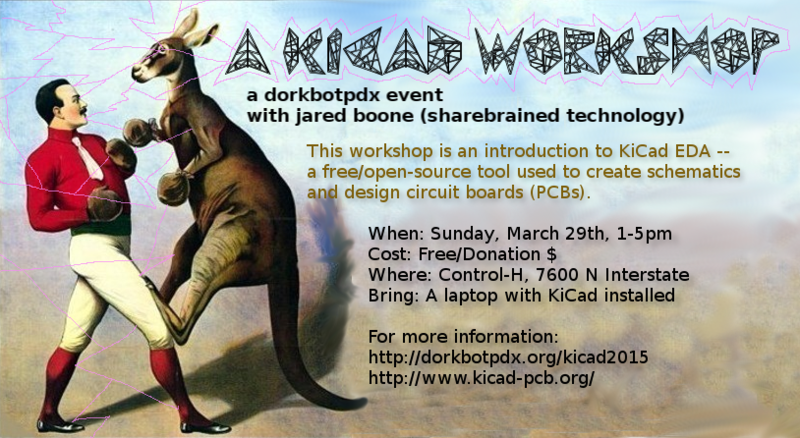 For this workshop, we'll target a Raspberry Pi with an ARM microprocessor. In order to interact with the system, we'll use a JTAG interface cable from FTDI. We won't do any hardware modifications, but we will hook up wires in weird and wonderful ways to make the Raspberry Pi do things it otherwise shouldn't. No equipment needed, everything is provided. Build your own Fuzzface distortion guitar pedal clone while learning about the history and theory of analog electric guitar distortion. General principles of building analog guitar effects will also be discussed. All parts will be provided for a working Fuzzface clone minus an enclosure. Please bring your own soldering tool, solder, wire cutters, and strippers. $30 fee covers cost of parts and PCB. In case you missed it last year (like me!) it's happening again! This hands-on microcontroller audio workshop will show you how to use a Teensy 3.2 and codec chip to generate and playback CD quality sound, and process and analyze audio in real time. $45 for kit Space is limited to 15 people! RSVP Required, email to [email protected]. Limited to 15 people. Jul 10, 2016 DORKBOTPDX JULY 2016 WORKSHOP: FAUST! Faust is a functional language for describing signal-processing networks. It has obvious applications in audio, but also has great potential for software-defined radio, subatomic physics, or any other situation where one might want to efficiently analyze streams of information.